**OPEN HOUSE SATURDAY 16TH MARCH** Robert Luff & Co are delighted to offer to market this character filled and well presented semi-detached family home, ideally situated in this sought after central location just yards from the mainline station with town centre shops, restaurants, bus routes and the beach all nearby. Accommodation offers entrance hall, bay fronted formal dining room, kitchen breakfast room and double aspect living room, upstairs are three good sized double bedrooms and modern family bathroom. Other benefits include off road parking, South facing rear garden and brick built outhouse. Attractive wood effect flooring, double glazed window to side aspect, two radiators, stairs leading up, telephone point, understairs storage cupboard housing meters, coved and skimmed ceiling. Double glazed bay window to front aspect, radiator, space for 8 seater table and chairs, feature coving with skimmed ceiling. Double glazed window to side aspect, one and a half bowl sink unit with mixer tap and drainer inset to roll top work surfaces and matching splash back, matching range of wall and base units, built in eye level double oven, four ring electric hob with extractor above, integrated washing machine, space and plumbing for tumble dryer, dishwasher and fridge freezer, space for table and chairs, fully tiled walls, door way into living room and double glazed door to side access garden. 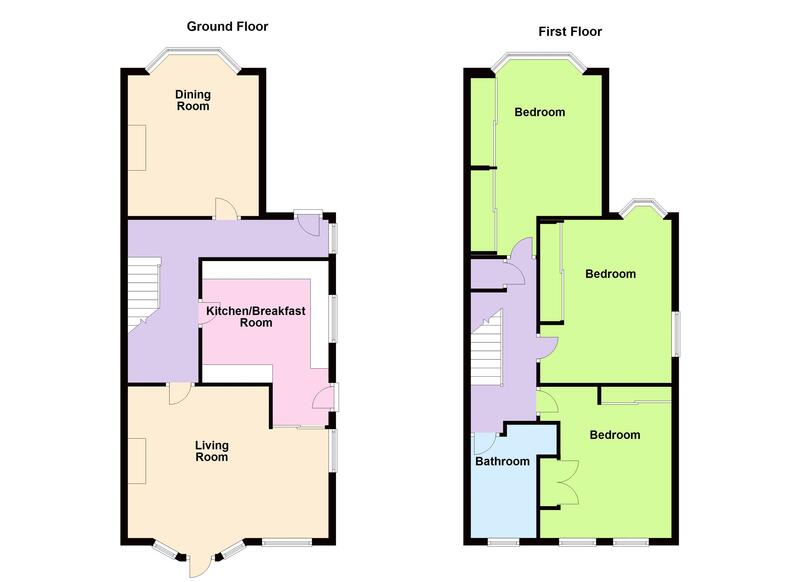 Double aspect with windows to side and rear aspects, bay with double glazed door overlooking and opening out into the garden, two radiators, TV point, telephone point, decorative wall lights, skimmed ceiling with spotlights. Loft hatch with pull down ladder to boarded loft, feature light tunnel, built in cupboard offering storage with further loft hatch, coved and skimmed ceiling. Feature double glazed bay window to front, radiator, range of fitted wardrobes offering hanging space and shelving, TV point, telephone point, coved and skimmed ceiling. Double glazed bay window to front, feature double glazed window to side aspect, radiator, range of fitted mirrored wardrobes with hanging space and shelving, coved and skimmed ceiling. Two double glazed windows to rear overlooking the garden, radiator, extensive range of fitted furniture with drawers, hanging space and shelving. Double glazed frosted window to rear, panel enclosed bath with central mixer tap and shower extension, low level flush w/c, wash hand basin inset to vanity unit with chrome mixer tap, walk in shower enclosure with power shower, tiled floor, part tiled walls, wall mounted heated towel rail, extractor fan. South facing and enclosed with a feature original brick wall, an attractive block paved patio wraps around the side of the house (path) and around the back offering the ideal place to entertain, while the rest is laid to lawn with flower and shrub boarders, gate providing side access and a brick built storage unit offers great space with power and light. Pebbled for ease of maintenance. Gated entrance, block paved providing off road parking.